BEMATON 3055 is a polycarboxylate ether based, high water reduction, latest generation super plasticizing (increasing concrete plastic properties) concrete admixture, which prevents decrease of concrete viscosity, provides high resistance and strength, and is improved for concrete industry. The product conforms to the requirements of the following standards: AZS 221-2006 (TS EN 934-2), Tables 3.1 and 3.2: “High water reduction, latest generation super plasticizing (increasing concrete plastic properties) concrete admixture”, and ASTM C 494 Type FF: “high water reduction, latest generation super plasticizing concrete admixture”. Preparation of the mixture. Mix the mineral adhesives (cement, quartz sand, volcanic cinders, slag) with concrete filler till the mixture is entirely homogeneous. 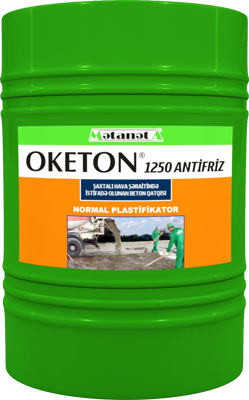 Add 50-70% of the required water amount and then add the BEMATON 3055 product together with the remained amount of water to the mixture. To provide homogeneous composition of BEMATON 3055 mixture vigorously mix it during 60 seconds or during time period predefined in the process of laboratory tests. Chemical mechanism of the latest generation plasticizers reaction. During the very initial stage of concrete mixing the surfaces of cement particles are covered with conventional melamine and naphthalenesulfonate based super plasticizing polymers. Sulfated groups of polymer chains increase negative loading of cement particles, and these particles are repelled by electrostatic force. This electrostatic mechanism results in disintegration of the cement paste, and enhances usage and preparation of the concrete with smaller amount of water added. Simultaneously the hydration process starts. The fast-growing hydration crystals change the surface mechanism of the particle, therefore preventing free disintegration of the particle surfaces. 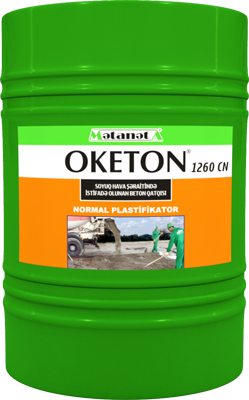 The difference between the BEMATON 3055 product and conventional super plasticizers (NSM or MSM) is in this new unique mechanism of influence which improves performance of the cement fraction. The BEMATON 3055 consists of long-chain carboxylate ether polymers. At the beginning of mixing process the electrostatic repelling mechanism starts similar to that of conventional super plasticizers. This process results in producing the plasticized concrete (with better plastic properties) due to significant reduction of the water demand. However the polymer bound chains stabilize disintegration and repellence properties of cement particles and create a sterile barrier. Due to this feature the smaller amount of water provides the higher plasticity (flow properties). 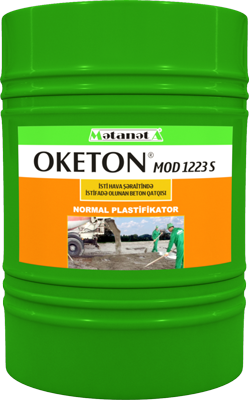 High alkalinity of cement paste provides unwinding and expansion of additional polymer chains in the structure of the BEMATON 3055 product preventing premature thickening of the concrete. This mechanism, compared to conventional super plasticizers of hardening inhibitor properties, does not inhibit the concrete hardening, but provides conditions for its long-term useful life and significant reduction of intensive water demand. The product cannot be used together with FLOTONseries (based on NSM) admixtures. 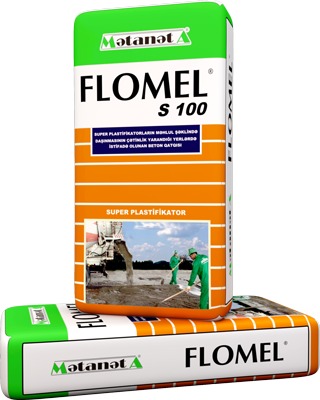 It is recommended to add the product in proportion of 1.0-2.0% of the cement amount. Depending on the concrete type and characteristics, amount of the admixture should be defined during preliminary laboratory tests. BEMATON 3055 should be stored in original packing in the areas with ambient temperature equal to or above +50C. The product stored in unsuitable conditions and exposed to freezing temperatures should be melted at room temperature without adding of water, then should be mixed using mechanical methods till it is entirely homogeneous. When mixing compressed air should not be used. Under required storage conditions, the product may be stored during 12 months from the manufacturing date. The product in open containers may be used during entire storage period provided the cap is kept closed. 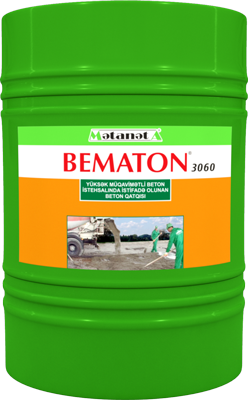 in case the BEMATON 3055 product is mixed with admixtures of other categories, the resulting quality will be poorer. On this reason this admixture should be handled with clean tools and devices only. parameters indicated above have been received on the basis of laboratory tests conducted in the ambient conditions of +230C±20C temperature and 50% +5% humidity. Depending on the actual ambient conditions these parameters are subject to change. 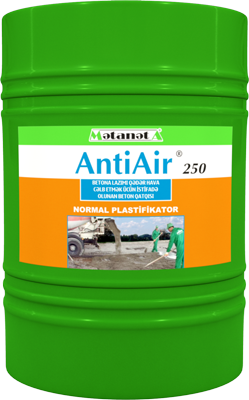 for technical support and/or more information please do not hesitate to contact the Matanat А company!